As a manufacturer we would not recommend changing the specification of vehicle, If any modifications are made and a fault occurs to the vehicle which could be attributed to these modifications, this could affect the warranty on the vehicle. 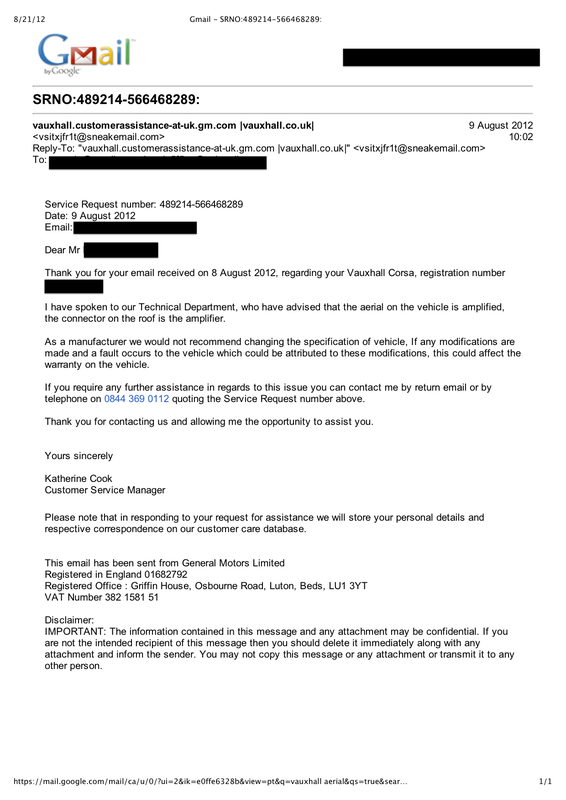 To be fair to Vauxhall the query I did ask them was answered promptly, politely and in full; the above was legalese I suspect they stick into all their emails. I therefore thought once I'd done the job, I'd put up a guide on line to assist others in a similar situation. Enjoy. Hope it helps. It is worth adding, I have no technical expertise in or love of either cars or audio systems, if you are going to follow this advice bear that in mind. Sony CDX-DAB700U car radio. Obviously. This comes with or without an internal windscreen-mounted DAB aerial. I chose the option that came with; it is possible to connect the radio to your regular aerial, but this is a whole level of technical expertise above what I possess (you also need to have an non-amplified aerial, the Corsa D has an amplified aerial as standard adding more complexity to this option). It also contains a wiring harness which converts the Sony 16 pin connection to an ISO 10487 connection. Autoleads PC5-110 Vauxhall Car Stereo Radio Removal Keys. I got these for about 97p on Amazon, although later I also got some thrown in free with the fascia adaptor I ordered. That's 97p I won't see again. Autoleads PC2-85-4 Wiring Harness with Fakra Aerial Adaptor. This wiring harness connects the Vauxhall Quadlock connector to the ISO 10487 end of the Sony supplied harness. In addition the version of this harness I bought also had a Fakra Aerial Adaptor wired in (I believe it is possible to buy a PC2-85-4 without this attached, in which case I think you will also then have to separately purchase a PC5-137 Car Audio Aerial Adaptor Lead for Fakra to DIN). This connects the Fakra aerial lead in the Vauxhall to the Sony DIN aerial, it also provided power for the aerial from the Sony ISO connector (more on this later at step 9). Autoleads FP-19-01/SS fascia adaptor (the SS stands for Shiny Silver, but your colour scheme could be different). The CD30 is a double DIN radio, the Sony a single DIN (i.e. it is half the size), therefore an adaptor is required to hold it in place in the center console. See the wikipedia article on ISO 7736 for more on radio sizes. A pair of plyers (I used an old Leatherman). Not essential, but useful for the fiddly bits. A small, flat-head screwdriver. Again not essential, but useful for things like loosening prongs. NB - The links above are Amazon or Ebay 'affiliate' links so if you were to buy after following the link then I would receive a very small amount of money. This money is used to contribute to the costs of hosting this site, but does not influence the content in any other way. Unplug the Quadlock connector and the Fakra aerial connector. To remove the Quadlock squeeze the locking tab by the retaining lever and swing the retaining lever up. The aerial connector also has a latch that needs to be released. Switch the power wires on the Sony wiring harness. 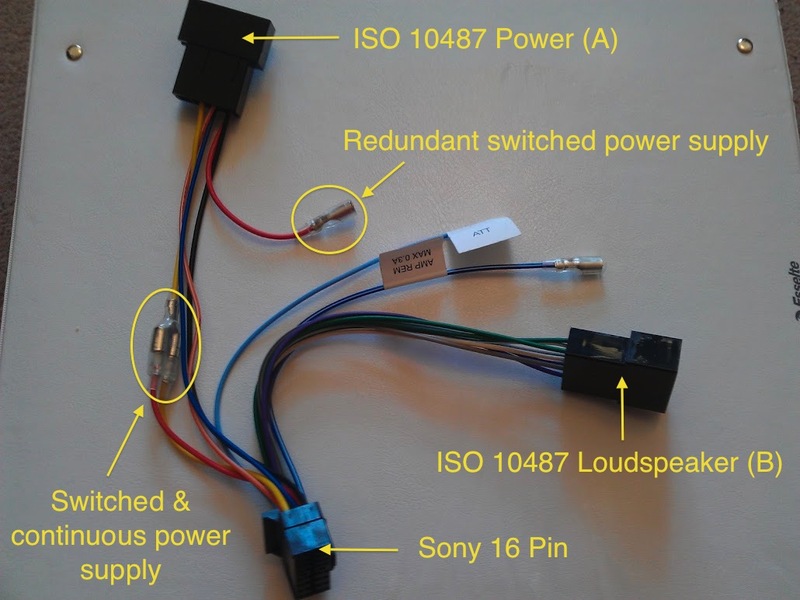 When the Sony wiring harness is taken out of the box the red wire from the Sony 16 pin connector connects to the red wire leading into the ISO 10487 Power (A) connector and the yellow wire does likewise. However this connection will not work for the Vauxhall Corsa D. Therefore using your plyers remove the red wire out of the connector (pulling on the metal not the wire) and insert the red male connector into the empty female yellow connector as above. Now you have the yellow wire from the ISO 10487 Power (A) connector running into both the yellow and red wires from the Sony 16 pin plug. It might actually be an idea to start with this step first, so you can do it on your kitchen table rather than cramped up in your car. But I didn't want to scare anyone by this guide launching straight into the technical bit. Why do I need to switch the power wires? Ok, so by now you are probably wondering why we have to do this. I'm going to try and explain. You can safely skip this section if you want, but it is useful background. Oh and it is my layman's take remember, I'm not an expert. Car radios require a constant source of power so that settings like channel selection are maintained; if they didn't get this constant power they would forget that, for example, you previously set memory button 4 to choose BBC Radio 4. However in the majority of cars when the keys aren't in the ignition the radio is not fully powered and you cannot turn it on. They therefore require the wiring to be set so that the radio gets a constant source of power to maintain the memory settings, but only gets the power to turn on when the keys are turned in the ignition. On the Sony wiring harness (and many others) this continuous source of power is represented by the yellow wire (the "continuous power supply" according to the installation guide) and the ignition-only source of power by the red wire ("switched power supply"). 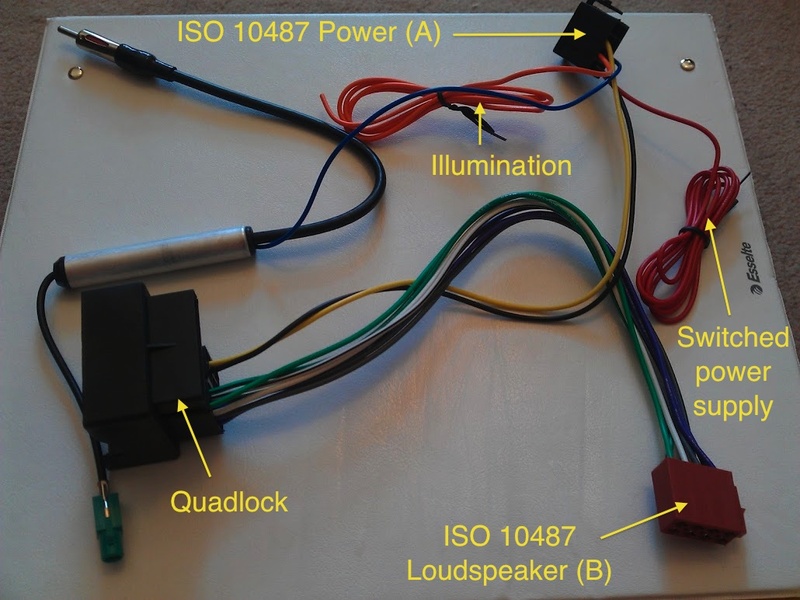 In most cars you provide the radio with power by turning the key to the first position, known as ACC (according to the Free Dictionary this is an abbreviation for Accessory), so ensuring you don't drain your battery by supplying power to the radio all the time. Vauxhall in their wisdom however have decided that this isn't how they are going to do things. The CD30 can by design turn on when your keys aren't anywhere near your car, let alone turned to the ACC position. Resultingly it does not require a constant power supply and a switched power supply; it just requires a single constant power supply. In the Quadlock connector this is represented by the yellow wire. We therefore switch the wires on the Sony wiring harness to feed both the red (switched) and yellow (constant) wires off the Quadlock's one yellow wire. Be sure to set the Auto Off function (page 25). The unit will shut off completely and automatically in the set time after the unit is turned off, which prevents battery drain. If you do not set the Auto Off function, press and hold SOURCE/OFF until the display disappears each time you turn the ignition off. 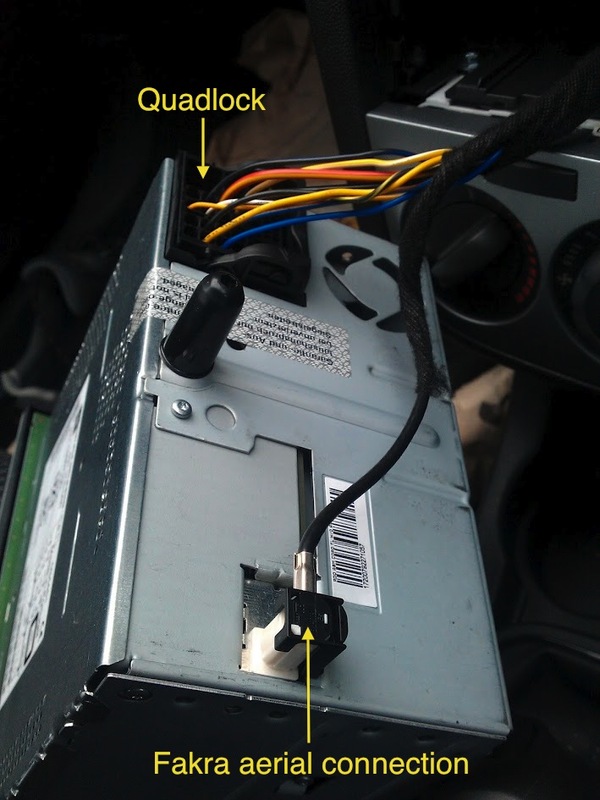 Another way to achieve the above would be to attach the loose red wire on the Autoleads PC2-85-4 Wiring Harness to somewhere on the car which is supplied with power in the ACC mode, for instance the cigarette lighter (and then not switch the wires on the Sony harness). Although this would be closer to how Sony designed the radio to work, it seems a lot more work for the same result. Feed the Sony DAB aerial into the console. The Sony DAB aerial is glued in place on the inside of the windscreen, once it is there, it is there for good, so I'd suggest you don't actually stick it in place until you are happy. 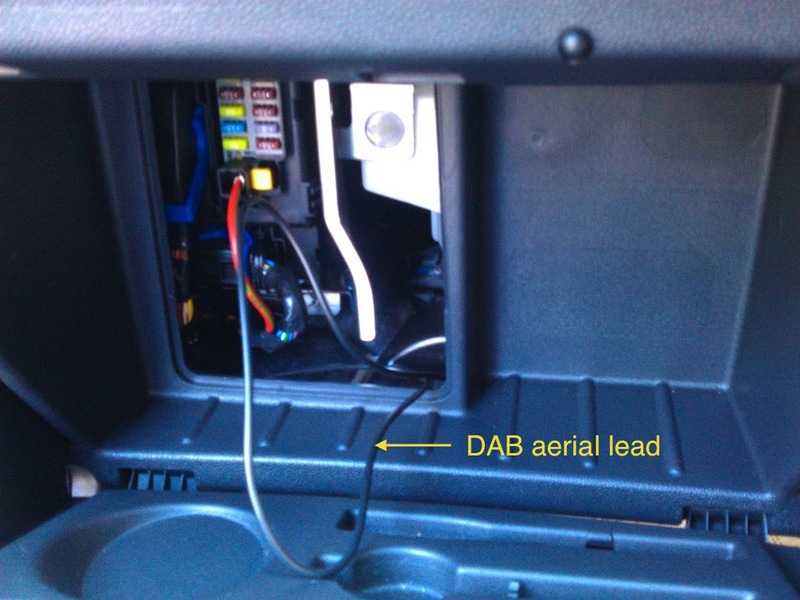 Interior of glovebox with fuse void space open and Sony DAB aerial being pulled through. This should be a relatively pain free step. Insert the Autoleads FP-19-01/S fascia adaptor into the console. This should slide into place and there are some clips on the upperside of the fascia which should fasten into the centre console. Remove the Sony metal bracket from the radio and slide it into the fascia. 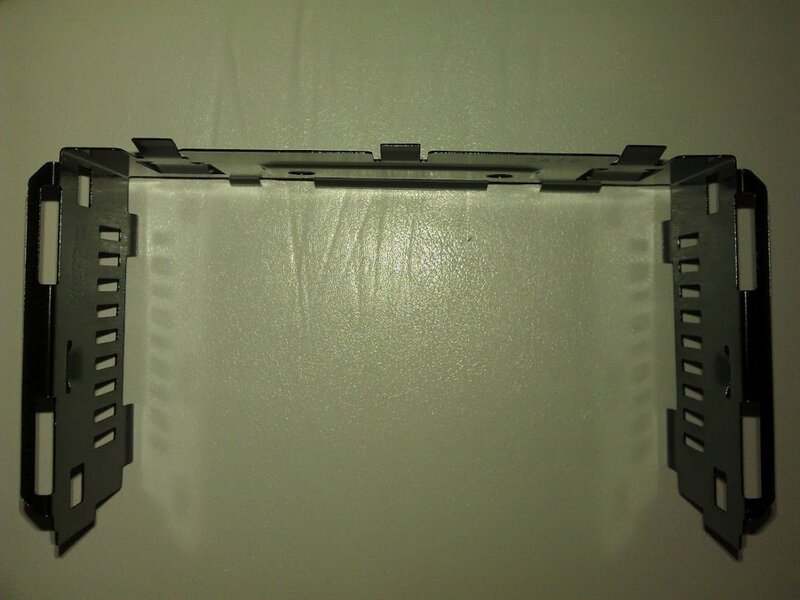 The procedure laid out in diagrams 4 and 5 of the installation guide should be followed to remove the bracket from the radio, which should then be slid into the fascia adapter you inserted in the above step. Around the edge of the bracket are prongs or claws which should be bent down/up with a screwdriver or similar so that the radio is held firmly in place when it is eventually placed in the bracket. Connect the Sony DAB aerial lead, which you wired into the console in step 5, into the port on the back of the radio. Easy. Place this to one side as it will not be required. Connect the DIN male into the Sony radio and the Fakra male into the Vauxhall's Fakra female. NB - The Fakra connection has a clip on it to secure the two connectors together, once I'd connected them the clip was so tight that I wasn't able to remove it without accidentally breaking the clip. This wasn't a problem as the connection was still secure, and this was probably just me being cack-handed, but you would want to be aware that once connected it is awkward to disconnect. So what's the blue wire for? Time for another explanation, which you can skip as it isn't entirely necessary. You will notice coming out of the silver metal tube that connects the Sony aerial to the Vauxhall aerial a thin blue wire which feeds into the ISO 10487 Power (A) connector. This blue wire eventually leads into pin 5 of the Sony 16 pin connetor which Sony state is responsible for "power antenna (aerial) control." Some car antennas are amplified, some are not. Vauxhall confirmed in an email to me that the aerial in a Corsa D is amplified, which would mean a power supply was needed for the amplifier. If the Vauxhall CD30 Fakra connector not only connected the aerial to the radio, but also provided the amplifier with power, then the aerial would require an alternative source of power if a different radio was fitted and this blue wire would now supply it. However it is possible that the amplified aerial is powered from a different source and that the blue wire is completely redundant. I could find this out by removing the blue wire and seeing if the FM reception changed. However as that might be difficult to revert back from, and the radio works fine now, I'm just going to leave as is. There is by the way a really useful guide to identifying aerial connectors from dabonwheels.co.uk. Connect the PC2-85-4 Quadlock to the Vauxhall Quadlock connector. You will need to lower the lever on the Vauxhall Quadlock to get them to connect firmly. Connect the Sony harness to the radio and then to the PC2-85-4 ISO Connectors. The Sony 16 Pin connector by the way once in, is very difficult to get out. I tried do so, broke some of the plastic and then decided it is probably best in place! How come I have left over red and orange wires from the ISO 10487 Power (A) Connector? Don't I need to connect them to somthing? The red wire is for the switched power supply. We took care of this at step 4, so it is now entirely redundant. The orange wire should be connected to the car lighting system. The idea behind this is that the radio automatically dims when the car headlights are turned on. A nice to have, but beyond my level of knowledge, so I left it unconnected. Now for the fun part. Attach the front panel and if everything has gone to plan the panel should light up and noise should emanate from your speakers. Now would be a good time to test it in all respects: DAB, FM, CD, iPod. If something isn't working you are only going to have to take it all out again, so best make sure. Push the radio into the bracket and fit the protection collar. It is a good idea to remove the front panel before pushing it in, just to prevent scratches. When the radio is all the way into the bracket it clicks into place. The protection collar fits over the top of the radio. As described in diagrams 5 and 6 in the installation guide. The guide also refers to attaching the radio to the "firewall," I didn't do this, again beyond my ken. Power on and enable Auto Off. And we're done. I'll let you glue the aerial in place yourself. I hope this has been useful. As for the Sony CDX-DAB700U itself, I like it. I was annoyed at first that my particular iPod (Classic fifth generation with video) is not fully supported, which basically means that to change a podcast I have to unplug it, find the podcast I want and plug it in again. Although it is a pretty easy fix around so I can't get too worked up about it. Unfortunately the USB connection does not work with later Android smartphones - which is what I now use for podcasts - the USB still charges the phone but you will need an Aux wire for audio; not elegant but it works. My next radio will have bluetooth as that seems a much better way of doing this. As for the DAB reception; it is very dependent on what part of the country you are in. I think if you really want the DAB part of this to be one hundred percent you will need an external aerial. The sound quality seems good (though I'm no audiophile). My entire sum of knowledge as regards car radios and installing them is contained on this page, so please don't contact me to ask any addtional questions - if Google can't answer your question, then I won't be able to. Having said that feel free to email me; although my work takes me off the grid a lot so please don't be offended if I don't reply in a hurry. Feel free to add comments or corrections below.